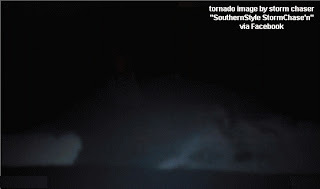 A large deadly tornado (at least EF3 intensity) struck the Birmingham AL area early this morning around 4 a.m. CST (1000 UTC, Monday 1/23/12), killing at least 2 people according to media information at early afternoon. The weather environment was primed for generating significant tornadoes before sunrise on Monday in Alabama. A RUC analysis sounding at 1000 UTC (see above) at Birmingham while the tornado was moving through showed a massively large wind profile (hodograph) with nearly semi-circular curvature, ideal for generating low-level rotation in storms when notable instability is also present. 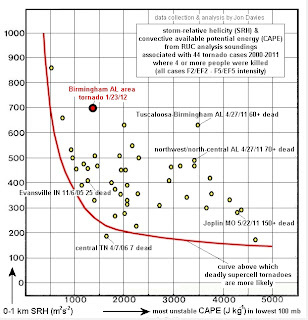 In this case, there was around 700 m2/s2 of storm-relative helicity, with mixed-layer CAPE between 1000 and 1500 J/kg, putting the storm environment in a statistically dangerous area on an SRH-CAPE diagram (see red dot on scatterdiagram above) regarding support for strong or violent tornadoes. 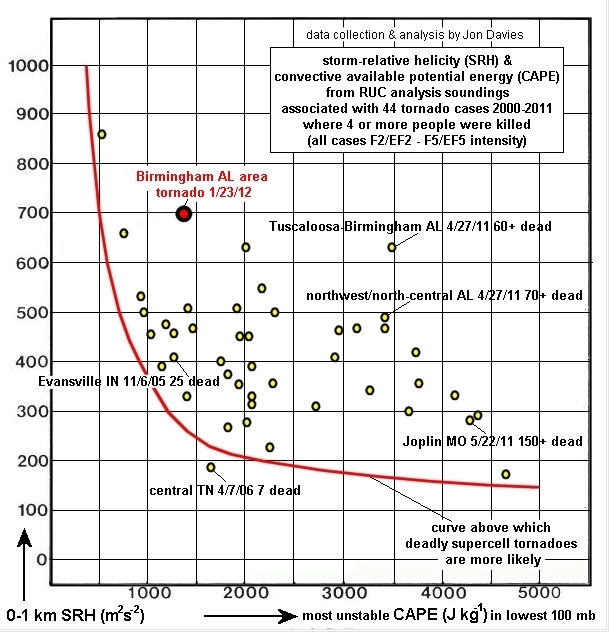 Compared to last Saturday's environment with severe storms in central Georgia (1/21/12, not shown) where representative SRH values were around 300 m2/s2 and CAPE was only 300-400 J/kg, this was a much more dangerous and life-threatening setting. The overnight SPC mesoanalysis also suggested potential for significant tornadoes (see the 0900 UTC SPC graphics above), with large SRH-CAPE combinations indicated in the same area where storms were moving through. A strong negatively-tilted trough at 500 mb (roughly 18,000 ft MSL, see last chart above) prompted the deadly severe weather, pulling deep moisture into Alabama from the Gulf of Mexico, generating strong low and mid-level wind fields, and providing strong lift and forcing. Given that it was still dark when the Birmingham area tornado moved through, the death toll could have been much larger. It surely helped that the storm potential was well-outlooked by SPC already on Sunday, and NWS warnings in the area were timely. 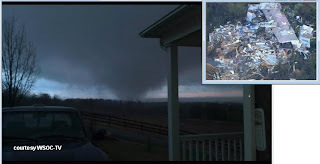 Yesterday's EF2 tornadoes in Rutherford and Burke counties of western North Carolina (see photos above) injured 10-15 people (one critically) and came as a bit of a surprise. This case is a good example of how difficult it is to forecast winter-time tornadoes. Instability (CAPE) is often small (around 500 J/kg or less), but wind shear and low-level storm-relative helicity (SRH) are often large (> 200-300 m2/s2); that makes it hard to assess when CAPE and SRH combinations are truly strong enough to support significant tornadoes. It's just as important to assess the strength and focus of the accompanying synoptic setting and how the CAPE/shear environment fits with that. The fixed-layer Sig Tor Parameter at 2100z (STP at 4 pm EST, see SPC mesoanalysis chart above) suggested a marginally favorable environment (> 1.0) for tornadoes over NW South Carolina inching into SW North Carolina, just ahead of the strong upper vorticity center seen earlier and the surface front, near the "triple point" where fronts met (see surface inset). These dynamic factors and environment provided enough focus for the south end cell of a broken arc of low-topped storms (see visible satellite image above) to become a damaging tornadic supercell as it moved into North Carolina. 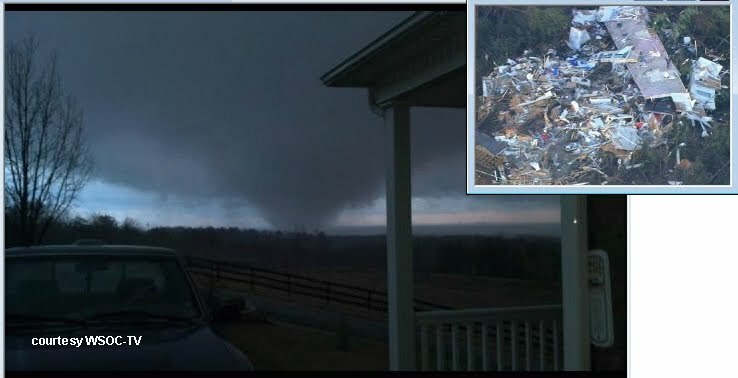 A similar setting the day before over Mississippi, but with somewhat less focus and slightly less favorable STP values (not shown), did not generate any tornadoes, illustrating how subtle and difficult winter tornado settings with small CAPE can be to assess, in contrast to days like the Joplin tornado where CAPE exceeded 4000 J/kg. Again, an awareness of how synoptic features come together or focus into a particular area (e.g., strong short wave and vorticity max, frontal orientation relative to those features, along with prefrontal environment) is important. Typically, STP or EHI values slightly larger than 1.0 aren't impressive, but the surface and upper-air dynamic focus in this case suggested more attention. A 2200 UTC RUC-estimated sounding at Shelby NC, about 20 minutes before the first tornado, is shown in the last graphic above. Notice that the CAPE was small (< 500 J/kg), but the SRH moderate to strong (260 m2/s2). With all the CAPE "compressed" below 400 mb (approximately 24,000 ft MSL), rapid supercell updraft accelerations may have been enhanced in low-levels, even though total CAPE was relatively small, helping with tilting and stretching of streamwise vorticity associated with SRH in the environment.